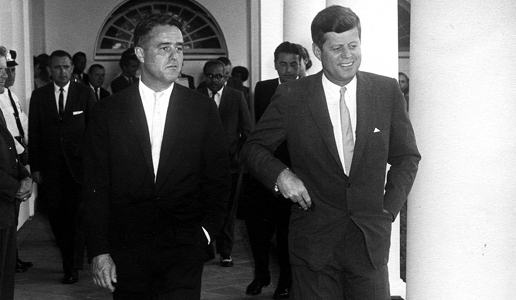 One of the most powerful men in American politics, Robert Sargent Shriver spent many years in the service of the American public. First, via his connection with the Kennedy family dynasty. Later, as the Kennedy family waned, Shriver stepped out on his own. Later in life, his legacy lived on through his daughter, Maria Shriver, who was inspired by her father’s Alzheimer’s disease to write several books on the subject aimed at children. Sargent Shriver has passed away at age 95 at a hospice in Bethesda, Maryland. Shriver’s life was linked with the Kennedy family, for better or worse. He briefly attended school with John F. Kennedy, and after serving with distinction in WWII, Shriver ended up marrying Kennedy’s sister Eunice. Later, after hearing Kennedy speak of a national volunteer group, Shriver started The Peace Corps and served as its first director from its inception in 1961 until 1966. He later ran for Vice President with George McGovern in 1970 and was briefly a Presidential candidate in 1976.